My quilt is 25" high x 34" wide. 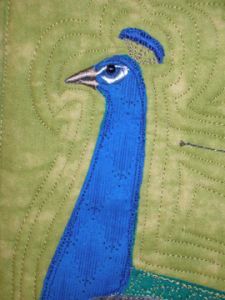 Yours may be a different size if you arrange the designs differently, or add paper piecing or appliques from other Critter Pattern Works patterns, such as Fancy Fowl, Exotic Birds, or Farmyard Friends. 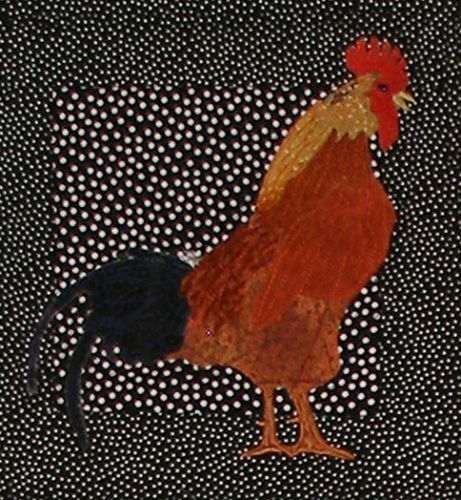 A photograph of this quilt was featured in the book "How to Raise Poultry" by Christine Heinrichs. This pattern is 10 pages (8 1/2" x 11") of drawings with tips, 5 pages of detailed instructions (if you can read and understand, and you know how to sew, you can do this!) and a color front cover and a back cover. If you get the pattern as a PDF file, the detail photos are in color. I took lots of detail shots in macro mode (see below) so you can see how the beaks and feet were satin stitched. In talking with our customers, both by email and in person at the shows, I found out that they wanted individual bird patterns for just a turkey or a peacock or a rooster. Well, I don't know how to put out a pattern with just one critter, so I combined these birds to come up with Fancy Fowl 2. If you are a rank beginner, start by making the turkey, since it only has three colors. All the fabrics are cut out and fused together using an iron-on glue like WonderUnder or Steam-A-Seam Lite. The rooster and the peacock take longer to assemble to get ready to stitch, because they have more colors (fabrics). For this quilt, I sewed all the blocks together without a single applique stitch (the appliques were fused to the backgrounds)! I added the border, then the batting and then did all the applique stitching, using the batting as my stabilizer. Generally, the stitching takes no time at all to do since it is raw edge technique (straight stitching using a darning foot). The beaks and legs and feet are satin stitched. 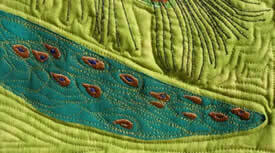 The eyespots of the peacock tail are satin stitched. The three feathers are all shown and described in detail and are straight stitched appliques, scribbling or drawing over the edge. Then I added the quilt backing and quilted all the backgrounds, stitched in my signature and then quilted the border and added the binding. You'll be amazed at how fast this goes together. PDF-format patterns are NOT available to our wholesalers. Wholesalers need to order printed patterns instead. When you order a PDF pattern, the download location will be sent within 24 hours of placing your order. The rooster's beak and legs are satin stitched. The sparkle on the neck is from the rayon thread stitched like feathers in little "u" shapes. 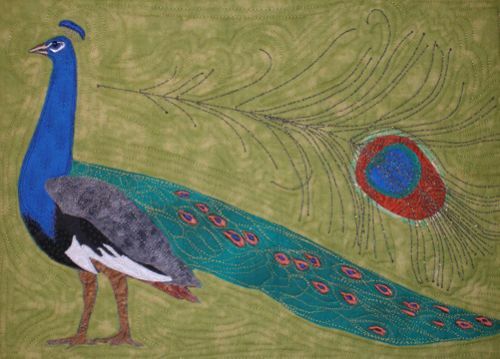 The peacock's beak and the white around the eye are satin stitched. The details on the tail are too. The legs are raw edge stitched.